Markham (/ˈmɑːrkəm/) is a city in the Regional Municipality of York within the Greater Toronto Area of Southern Ontario, Canada. It is located approximately 30 km (19 mi) northeast of Downtown Toronto. The city is the fourth-most populous community within the Greater Toronto Area after Toronto, Mississauga and Brampton and is York Region's most populous municipality. In the Canada 2016 Census, Markham held a population of 328,940 The municipality is also Canada's 16th largest city. Markham changed its status from town to city on July 1, 2012. The city gained its name from the first Lieutenant-Governor of Upper Canada, John Graves Simcoe (in office 1791–1796), who named the area after his friend, William Markham, the Archbishop of York from 1776 to 1807. The first European settlement in Markham occurred when William Berczy, a German artist and developer, led a group of approximately sixty-four German families to North America. While they planned to settle in New York, disputes over finances and land tenure led Berczy to negotiate with Simcoe for 64,000 acres (260 km2) in Markham Township in 1794. Through much of Markham's history the community has been described[by whom?] as an agricultural community. A turn towards a more urbanized community within the township began after World War II when the township began to feel the effects of urban encroachment from Toronto. The completion of Highway 404 during the mid-1970s accelerated urban development in Markham. As of 2013[update] tertiary industry mainly drives Markham. As of 2010[update] "business services" employed the largest proportion of workers in Markham – nearly 22% of its labour force. The city also has over 1,000 technology and life-sciences companies, with IBM as the city's largest employer. A number of multinational companies also have their Canadian headquarters located in Markham, including: Honda Canada, Hyundai, Advanced Micro Devices,Johnson & Johnson, Avaya,IBM,Motorola,Oracle,Toshiba,Toyota Financial Services, Huawei and Honeywell. Objects recovered by a local mill owner, the Milne Family, in the 1870s give evidence of a village within the boundaries of the present Milne Conservation Area. John Graves Simcoe named the township of Markham, north of the town of York (now Toronto), after his friend William Markham, the Archbishop of York. Markham was first surveyed as a township in 1793 by William Berczy, who in 1794 led 75 German families including the Ramers, Reesors, Wheters, Burkholders, Bunkers, Wicks and Lewis from Upstate New York to an area of Markham now known as German Mills. Each family was granted 200 acres (0.81 km2) of land; however the lack of roads in the region led many to settle in York (now Toronto) and Niagara. German Mills later became a ghost town. Between 1803 and 1812, another attempt at settling the region was made. The largest group of settlers were Pennsylvania Dutch, most of whom were Mennonites. These highly skilled craftsmen and knowledgeable farmers settled the region and founded Reesorville, named after the Mennonite settler Joseph Reesor. In 1825, Reesorville was renamed to Markham having taken the name of the unincorporated village (see Markham Village, Ontario). By 1830, a large number of Irish, Scottish and English families began immigrating to Upper Canada, many settling in Markham. Markham's early years blended the rigours of the frontier with the development of agriculture-based industries. The many rivers and streams in the township soon supported water-powered saw and gristmills and later wooden mills. With improved transportation routes, such as the construction of Yonge Street in the 1800s, along with the growing population, urbanization increased. In 1842 the township population was 5,698; 29,005 acres (117.38 km2) were under cultivation (second highest in the province), and the township had eleven gristmills and twenty-four sawmills. The 1846 Gazetteer indicates a population of about 300, mostly Canadians, Pennsylvanian Dutch (actually Pennsylvania Deitsch or German), other Germans, Americans, Irish, and a few from Britain. There were two churches with a third being built. There were tradesmen of various types, a grist mill, an oatmill mill, five stores, a distillery and a threshing machine maker. There were eleven grist and twenty-four saw mills in the surrounding township. In 1850, the first form of structured municipal government formed in Markham. By 1857, most of the township had been cleared of timber and was under cultivation. Villages like Thornhill, Unionville, and Markham greatly expanded. In 1851 Markham Village "was a considerable village, containing between eight and nine hundred inhabitants, pleasantly situated on the Rouge River. It contains two grist mills ... a woollen factory, oatmeal mill, barley mill, and distillery, foundry, two tanneries, brewery, etc., a temperance hall and four churches... ." In 1871, with a township population of 8,152, the Toronto and Nipissing Railway built the first rail line to Markham Village and Unionville, which is still used today by the GO Transit commuter services. In 1972, Markham was incorporated as a town, as its population skyrocketed due to urban sprawl from Toronto. In 1976, Markham's population was approximately 56,000. Since that time, the population has more than quintupled with explosive growth in new subdivisions. Much of Markham's farmland has disappeared, but is still found north of Major Mackenzie Drive. Controversy over the development of the environmentally sensitive Oak Ridges Moraine will likely curb development north of Major Mackenzie Drive and by Rouge National Urban Park east of Reesor Road between Major Mackenzie Drive to Steeles Avenue East to the south. Ever since the 1980s, Markham has been recognized as a suburb of Toronto. As of 2006, the city comprises six major communities: Berczy Village, Cornell, Markham Village, Milliken, Thornhill, and Unionville. Many high-tech companies have head offices located in Markham for the relative abundance of land, low tax rates and good transportation routes. Broadcom Canada, ATI Technologies (now known as AMD Graphics Product Group), IBM Canada, Motorola Canada, Honeywell Canada and many other well-known companies have chosen Markham as their home in Canada. Hence, the city has been branding itself as Canada's "High-Tech Capital". An Ontario Historical Plaque was erected in front of the Markham Museum by the province to commemorate the founding of Markham's role in Ontario's heritage. 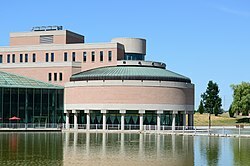 Town council voted on May 29, 2012, to change Markham's legal designation from "town" to "city"; according to councillor Alex Chiu, who introduced the motion, the change of designation merely reflects the fact that many people already think of Markham as a city. Some residents objected to the change because it will involve unknown costs without any demonstrated benefits. The designation officially took effect on July 1. Public housing in Cachet, Ontario. Markham covers an area of 212.47 km2 (82.04 sq mi) and Markham's City Centre is at 43°53′N 79°15′W﻿ / ﻿43.883°N 79.250°W﻿ / 43.883; -79.250. It is bounded by 5 municipalities; in the west is Vaughan with the boundary along Yonge Street between Steeles Avenue and Highway 7 and Richmond Hill with the boundary along Highway 7 from Yonge Street to Highway 404 and at Highway 404 from Highway 7 to 19th Avenue and Stouffville Road. In the south, it borders Toronto with the boundary along Steeles Avenue. In the North it borders Whitchurch–Stouffville with the boundary from Highway 404 to York-Durham Line between 19th Avenue and Stouffville Road. In the East it borders Pickering along the York-Durham Line. Markham's average altitude is at 200 m (660 ft) and in general consists of gently rolling hills. The city is intersected by two rivers; the Don River and Rouge River, as well as their tributaries. To the north is the Oak Ridges Moraine, which further elevates the elevation towards the north. Markham borders and shares the same climate as Toronto. On an average day, Markham is generally 1–2 °C (1.8–3.6 °F) cooler than in downtown Toronto. It has a humid continental climate (Köppen climate classification Dfb) and features warm, humid summers with significant rainfall occurring from May to October and cold, snowy winters. The highest temperature recorded was 37.8 °C (100 °F) on August 8, 2001, and the lowest temperature recorded was −35.2 °C (−31 °F) on January 16, 1994. According to the 2011 Canadian Census, the population of Markham is 301,709, a 15.3% increased from 2006, which is approximately 3 times faster than Canada as a whole. Markham's land mass is 212.58 km2 with a consequent population density of 1,419.3 people per km2. The median age is 39.6 years old which is slightly lower than the median age of Canada at 40.6 years old. According to the 2011 National Household Survey, 89.3% of Markham's residents are Canadian citizens, and about 14.5% of residents are recent immigrants (from 2001 to 2011). The racial make up of Markham is; East Asian (39.7%), White (27.5%), South Asian (19.1%), Southeast Asian (3.9%), Black (3.2%), West Asian & Arab (3.2%), Latin American (0.5%), Aboriginal (0.2%), and 1.9% of the population is multiracial while the rest of the population (0.7%) is of another group. 29.9% of Markham's population does not affiliate with any particular religion. For those who do, the religious make up is Christian (44.1%), Hindu (10.1%), Muslim (7.3%), Buddhist (4.4%), Jewish (2.4%) and Sikh (1.4%). The remaining population is divided between various belief systems. As far as education goes, for those who are 25 to 64 years old, the highest levels of education achieved are as follows: 69.5% of people have a post-secondary degree, 20.5% have a high school diploma or equivalent, and 10.0% have less than a high school diploma. Markham's unemployment rate is 8.1%, just over the national average of 7.8%. Its median household income before taxes is $86,022; after taxes it is $75,135, quite a bit higher than the national average of $54,089. Markham City Council consists of Frank Scarpitti as mayor, four regional councillors and eight ward councillors each representing one of the city's eight wards. Scarpitti replaced Don Cousens, who was a former Progressive Conservative MPP for Markham and a Presbyterian church minister. The mayor and four regional councillors are elected by the community to represent the City of Markham at the regional level. Councillors are paid by the municipality for their services, but in many municipalities, members of council usually serve part-time and work at other jobs as well. The current members of council were elected by the residents to a four-year term of office, in accordance with standards set by the province. The selection of members for the offices of mayor and regional councillors are made town-wide, while ward councillors are elected by individual ward. The city council is located at the Markham Civic Centre at the intersection of York Regional Road 7 and Warden Avenue. The site of the previous offices on Woodbine Avenue has been redeveloped for commercial uses. The historic town hall on Main Street is now a restored office building. The Mayor's Youth Task Force was created to discuss issues facing young people in the city and to plan and publicize events. Its primary purpose is to encourage youth participation within the community. There are no courts in Markham, but the city is served by an Ontario Court of Justice in Newmarket, as well as an Ontario Small Claims court in Richmond Hill. There are also served by a Provincial Offence Court in Richmond Hill. The Ontario Court of Appeal is located in Toronto, while the Supreme Court of Canada is located in Ottawa, Ontario. Policing is provided by York Regional Police at a station (5 District) at the corner of McCowan Road and Carlton Road and Highway 7. Highway 404, Highway 407 and parts of Highway 48 are patrolled by the Ontario Provincial Police. Toronto Police Service is responsible for patrol on Steeles from Yonge Street to the York—Durham Line. Markham Fire and Emergency Services was established in 1970 as Markham Fire Department and replaced various local volunteer fire units. There are 9 fire stations currently serving Markham. Toronto/Buttonville Municipal Airport is also served by Markham's Fire service. Markham Stouffville Hospital located in the far eastern end of the city, is Markham's main healthcare facility. Markham is also home to Shouldice Hospital, one of the world's premier facilities for people suffering from hernias. For those living near Steeles, they sometimes will be able to receive treatment at The Scarborough Hospital Birchmount Campus in Toronto/Scarborough. Seneca College has a campus in Markham, at highways 7 and 404, in the York Region business district. This location opened in 2005, offering full and part-time programs in the areas of business, marketing and tourism, and also the college's departments of Finance, Human Resources and Information Technology Services. Since 2011 the campus has also housed the Confucius Institute. In May 2015, York University announced plans to open a new campus west of the Markham Pan Am Centre, with specifics published in November 2017. This facility would be operated in collaboration with Seneca College, and was expected to open in 2021. The majority of the funding for the project, $127 million, would come from the provincial government which provided approval in June 2017. On 23 October 2018 however, the new provincial government (elected in June) withdrew the funding for plans such as this, effectively cancelling the York satellite campus. The university planned to seek new donors for the project. The York Region District School Board operates secular Anglophone public schools. The York Catholic District School Board operates Anglophone Catholic schools. The Conseil scolaire Viamonde operates secular Francophone schools, and the Conseil scolaire de district catholique Centre-Sud operates Catholic Francophone schools. In the 19th century Markham had a vibrant, independent community with mills, distilleries and breweries around the Highway 7 and 48 intersection. The Thomas Speight Wagon Works exported products (wagons, horsecars) around the world, and Markham had a reputation as being more active than York (the former name for Toronto) early on. Most of these industries disappeared leaving farming as the main source of business. Light industries and businesses began to move into Markham in the 1980s attracted by land and lower taxes. Today, it claims to be "Canada's Hi-Tech Capital" with a number of key companies in the area, such as IBM, Motorola, Toshiba, Lucent, Honeywell, Apple, Genesis Microchip, and is home to the head office of graphics card producer ATI (recently merged with AMD). Over 1,100 technology and life science companies have offices in Markham, employing over one fifth of the total workforce. In 2014, the top five employers in the city in order are IBM Canada, the City of Markham, TD Waterhouse Inc., Markham Stouffville Hospital and AMD Technologies Inc.
Yogen Früz has its headquarters in Markham. General Motors Canada Canadian Technical Centre is located in Markham since 2017, which was formerly Canadian head office of American Express from 1985-2015. A key arts venue is the 'Markham Theatre For Performing Arts', at the Markham Civic Centre located at Highway 7 and Warden Avenue. The facility is owned by the City of Markham and under the city's Culture Department. Until the 1970s, Markham was mostly farmland and marsh, as reflected in events like the Markham Fair. Markham has several theatres, Markham Little Theatre at the Markham Museum, the Markham Youth Theatre, and the Markham Theatre. Markham offers a mix of activities for its residents to promote its idea of being a place for all. It does this through cultural, entertainment and institutional activities in hopes that its residents will find one or more of these events attractive. Activities are also free to take place on streets and squares where people live, work, shop and play to make events more accessible for its residents. Its buildings and public transportation are designed with an attractive and inviting attitude in mind to create a more comfortable space. The City also values the importance of a “walkable” downtown as it allows its residents to enjoy buildings and services being in walking distance of each other. This space is pedestrian friendly, creating an accessible space for all. Overall, Markham aims to put its residents and their families first, bringing jobs closer into its boundaries and protecting the environment. Markham has scenic pathways running over 22 km over its region. These pathways include 12 bridges allowing walkers, joggers and cyclists to make use and enjoy the sights it has to offer. Markham's green space includes woodlots, ravines and valleys that are not only enjoyable to its residents, but are important for the continued growth of plants and animals in the region. These natural spaces are the habitats for rare plant and insect species, offering food and homes essential for the survival of different native insects and birds. Parks and pathways are maintained by the City's Operations Department. Heintzman House – Home of Colonel George Crookshank, Sam Francis and Charles Heintzman of Heintzman & Co., the piano manufacturer. Locust Hill Station – built in 1936 in Locust Hill, Ontario and last used by the CPR in 1969; re-located in 1983 to the grounds of the Markham Museum; replaced earlier station built in the late 19th Century for the Ontario and Quebec Railway and burned down in 1935. Unionville Station – built in 1871 by the Toronto and Nipissing Railway, later by Via Rail and by GO Transit from 1982 to 1991; it was sold to the city in 1989 and restored as a community centre within the historic Unionville Main Street area. The building features classic Canadian Railway Style found in Markham and (old) Unionville Stations. Events taking place annually include the Night It Up! Night Market, Taste of Asia Festival, Tony Roman Memorial Hockey Tournament, Markham Youth Week, Unionville Festival, Markham Village Music Festival, Markham Jazz Festival, Milliken Mills Children's Festival, Markham Ribfest & Music Festival, Doors Open Markham, Thornhill Village Festival, Markham Fair, Olde Tyme Christmas Unionville, Markham Santa Claus Parade and Markham Festival of Lights. Pacific Mall is the most well-known Chinese mall in Markham, located at Kennedy Road and Steeles Avenue East, which, combined with neighbouring Market Village (now closed) and Splendid China Mall, formed the second largest Chinese shopping area in North America, after the Golden Village in Richmond, British Columbia. In close proximity, at Steeles East and Warden Avenue, there is the New Century Plaza mall and a half-block away there is a plaza of Chinese shops anchored by a T & T Supermarket. Major highways passing through Markham include Highway 404 (from Toronto to just south of Lake Simcoe) and Highway 407, a toll highway that passes north of Toronto and connects Markham with Burlington and Oshawa. Highway 407 primarily serves Markham from Yonge Street to York-Durham Line. The highway connects Markham with Oshawa to the east, and Burlington to the west. The highway is being extended east of Markham to Highway 35\115. Once completed in late 2019, it will provided a fast link from Markham to Peterborough. Highway 407 runs parallel to Highway 7, also known as York Regional Road 7, which is a major east-west artery suffering from congestion due to development along its route. Other major east-west routes include 16th Avenue, Major MacKenzie Drive, and Steeles Avenue which forms Markham's southern boundary with Toronto. Passenger rail service in Markham is provided by the GO Transit Stouffville line, which is a commuter rail line stretching from Lincolnville to downtown Toronto. The line operates only at rush hour and uses tracks owned by Metrolinx, the provincial transit agency. Five stations on the Stouffville line serve Markham, of which 4 are within the municipal borders. Metrolinx announced in 2015 that the Stouffville Line would get an expansion in service, bringing all day both directional trains from Union Station to Unionville GO Station. Markham's section of this GO line also came under the spotlight in 2015 as City of Toronto Mayor John Tory's announced SMART Track plan for rapid transit expansion in Toronto includes the rail spur between Union Station and the Unionville GO. YRT has two major terminals in Markham: Unionville GO Terminal and Markham Stouffville Hospital Bus Terminal. The new Cornell Terminal which will be located on Rose Way near Ninth Line and Highway 7 is approved and construction would begin by late 2017 and to be completed in June 2019 which will result in major restructuring routes in Markham. This new bus terminal will replace the transit hub along Church Street at Country Glen Road. The TTC also provides service in Markham on several north-south routes, such as Warden Avenue, Birchmount Road, McCowan Road and Markham Road. These routes charge riders a double fare if they are travelling across the Steeles border. Toronto/Buttonville Municipal Airport, Canada's 11th busiest airport (Ontario's 4th busiest). The airport permits general aviation and business commuter traffic to Ottawa and Montreal, Quebec. The airport is slated to close for development, but it has been delayed until at least 2023. Markham Airport or Toronto/Markham Airport, (TC LID: CNU8), is a private airport operating 2.6 nautical miles (4.8 km; 3.0 mi) north of Markham, north of Elgin Mills Road. The airport is owned and operated by Markham Airport Inc. and owned by a numbered Ontario company owned by the Thomson family of Toronto. The airport is not part of the Greater Toronto Airports Authority (GTAA). The airport consists of a single 2,013 ft (614 m) runway for small and private aircraft only (with night flying capabilities). The Royal Canadian Air Cadets Gliding Program uses the north side or the runway 09/27 for glider operations in the spring and fall months, and use a northern traffic pattern. "(Code 3519036) Census Profile". 2011 census. Statistics Canada. 2012. Retrieved 2012-02-08. "(Code 3519036) Census Profile". 2016 census. Statistics Canada. 2017. Retrieved 2017-02-12. ^ "Markham". Natural Resources Canada. October 6, 2016. ^ Tuckey, Bryan (24 July 2015). "Why Markham is the next highrise community". Toronto Star. Retrieved 12 April 2016. ^ "Markham Demographics 2016" (PDF). ^ a b c "Markham to change from town to city". CBC News, May 30, 2012. ^ "A history of the town of Markham". City of Markham. The Corporation of the City of Markham. 2012. Retrieved 2013-04-09. ^ "Labour Force Profile" (PDF). Economic Profile Year End 2010. Town of Markham Economic Development Department. 2010. p. 10. Retrieved 26 May 2011. ^ "Markham Quick Facts - 2016". ^ "Why is Markham Canadaès High-Tech Capital?". Town of Markham. The Corporation of the Town of Markham. 2011. Retrieved 26 May 2011. ^ "Top 10 Employers in Markham" (PDF). Town of Markham. April 2011. Retrieved 26 May 2011. ^ "AMD Locations". AMD. Advanced Micro Devices, Inc. 2011. Retrieved 26 May 2011. ^ "Connect with Avaya". Avaya. Avaya Inc. 2011. Retrieved 26 May 2011. ^ "IBM: Helping Canada and the World Work Better". About IBM. IBM. Retrieved 26 May 2011. ^ "Office Locations". About Us. Motorola Solutions, Inc. 2011. Retrieved 26 May 2011. ^ "Contact Us - Oracle Canada". www.oracle.com. ^ "Contact Us". Support. Toshiba Canada. 2011. Retrieved 26 May 2011. ^ "Toyota Canada - Cars, Pickup Trucks, SUVs, Hybrids and Crossovers". Toyota Canada. ^ a b City of Markham (2014). "Aboriginal Presence in the Rouge Valley". City of Markham Tourism. ^ For a complete history, cf. Isabel Champion, ed., Markham: 1793–1900 (Markham, ON: Markham Historical Society, 1979). ^ See I. Champion, Markham: 1793–1900 (Markham, ON: Markham Historical Society, 1979), p. 248; also Markham Village – A Brief History 1800–1919 Archived 2011-06-10 at the Wayback Machine, Markham Public Library (website). ^ For a complete history of Markham's early years, cf. Isabel Champion, ed., Markham: 1793–1900 "Markham: 1793–1900". Retrieved 2018-01-18. (Markham, ON: Markham Historical Society, 1979). ^ Markham, Canadian Gazetteer (Toronto: Roswell, 1849), 111. ^ Smith, Wm. H. (1846). Smith's Canadian Gazetteer - Statistical and General Information Respecting All Parts of the Upper Province, or Canada West:. Toronto: H. & W. ROWSELL. p. 111. ^ Cf. C.P. Mulvany, et al, The Township of Markham, History of Toronto and County of York, Ontario (Toronto: C.B. Robinson, 1885), 114ff. ^ Cf. 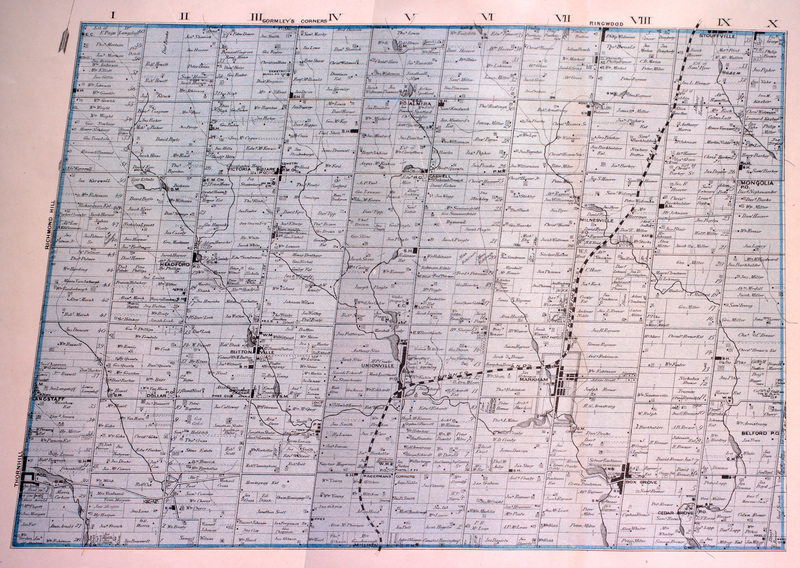 the detailed 1878 map, Township of Markham, Illustrated historical atlas of the county of York and the township of West Gwillimbury & town of Bradford in the county of Simcoe, Ont. (Toronto : Miles & Co., 1878). ^ C.P. Mulvany, et al., "The Village of Markham," History of Toronto and County of York, Ontario (Toronto: C.B. Robinson, 1885), p. 198. ^ C.P. Mulvany, et al., "The Township of Markham," History of Toronto and County of York, Ontario (Toronto: C.B. Robinson, 1885), p. 121. ^ "Ontario Plaque". Ontarioplaques.com. 2009-09-22. Retrieved 2011-03-10. ^ a b "Toronto Buttonville Airport". Canadian Climate Normals 1981−2010. Environment Canada. Retrieved 2014-04-12. ^ Cf. Isabel Champion, ed., Markham: 1793–1900 (Markham, ON: Markham Historical Society, 1979), pp. 225; 121f. ; 148; 227; 338. See also articles on Almira from the Stouffville Tribune. ^ "Census Profile for Markham, Town". statcan.gc.ca. Retrieved 2012-10-26. ^ "#5 District - Markham ." York Regional Police. Retrieved on September 19, 2018. "8700 McCowan Road Markham, ON L3P 3M2"
^ "Markham Campus". Seneca College. 23 May 2018. ^ "Confucius Institute at Seneca Opening Ceremony - Seneca - Toronto, Ontario, Canada". Senecacollege.ca. Retrieved 24 October 2018. ^ "STATISTICS AND DEMOGRAPHICS". City of Markham. City of Markham. 2014. Retrieved 2015-11-20. ^ "Top 100 Employers in Markham, 2014" (PDF). City of Markham. City of Markham. April 2015. Retrieved 2015-11-20. ^ "Contact Us." Yogen Früz. Retrieved on March 15, 2014. "Yogen Früz headquarters 210 Shields Court; Markham, Ontario L3R 8V2, Canada"
^ "Markham Museum Facilities" (PDF). Retrieved November 23, 2018. ^ "City of Markham – Vision". www.markham.ca. Retrieved 2016-09-26. ^ "City of Markham – Trees, Parks & Pathways". www.markham.ca. Retrieved 2016-09-26. ^ "The Local Magazine - News, Views and Opinions". www.thelocalmagazine.com. ^ Kalinowski, Tess (2015-08-07). "The new train service is expected to be in the off-peak hours". The Toronto Star. ISSN 0319-0781. Retrieved 2015-11-20. ^ Kalinowski, Tess (2015-04-16). "Kitchener and Stouffville GO lines are on track for electrification needed to boost service frequencies". The Toronto Star. ISSN 0319-0781. Retrieved 2015-11-20. ^ "transit terminal / Markham - vivaNext". www.vivanext.com. ^ "Total aircraft movements by class of operation — NAV CANADA towers". Statcan.gc.ca. 2010-03-12. Retrieved 2011-03-10. ^ "The City of Markham and Eabametoong First Nation Sign Partnership Accord". Indigenous Business & Finance Today. 1 February 2017. ^ "The City of Markham and Eabametoong First Nation Sign Partnership Accord". City of Markham. January 31, 2017. Retrieved November 23, 2018. ^ "Active Alliance Partner - Wuhan, China". City of Markham. Retrieved 18 January 2018. ^ "Sister Cities & International Partners". City of Markham. Retrieved January 28, 2019. Wikivoyage has a travel guide for Markham.